For Undocumented Immigrants, Getting A Driver's License Could Spell Trouble With ICE In 12 states and Washington, D.C., people in the country illegally can still get a driver's license. The process is meant to keep roads safe, but may put undocumented people at risk of deportation. Farmworkers marched to the federal courthouse in November in Burlington, Vt. to file a lawsuit that alleges their leaders were targeted by ICE, with the help of the state DMV. In Vermont, migrant dairy farmworkers were targeted for deportation after they obtained drivers licenses, according to a federal lawsuit filed by Migrant Justice, a local activist group. The suit cites documents obtained under the state access to public records law that show the state Department of Motor Vehicles forwarded names, photos, car registrations, and other information on migrant workers to Immigration and Customs Enforcement, or ICE. In one email, a state worker passed along "south of the border names" to ICE. In another email, ICE says a DMV worker should be recognized as an honorary agent. Routine information sharing between the Vermont DMV was supposed to stop under a 2016 settlement with the state Human Rights Commission. But Lia Ernst, a lawyer with the Vermont ACLU, which brought the case that led to the settlement, said the cooperation has continued. Ernst is also among a team of lawyers who filed the federal lawsuit. "What DMV has been sharing are photos, all the application materials, even going so far as to advise when people are coming in for appointments so that ICE come in and detain them there," she said. This kind of Information sharing happens around the country, according to an investigation by the National Immigration Law Center. The pro-immigration nonprofit found that ICE accesses a national database of licenses and also gets more detailed information through relationships with state DMV employees. Enrique Balcazar, a leader of a local group called Migrant Justice, faces deportation. He says records show his immigration status was flagged to ICE by a DMV worker in emails. ICE says it does not target political activists. 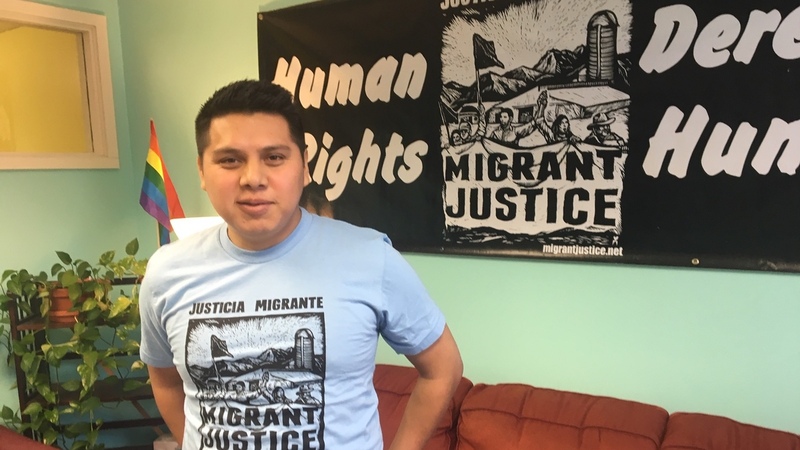 Enrique Balcazar, a farmworker and a leader of a local group called Migrant Justice, now faces deportation after his arrest by ICE in March, 2017. He said the records show he was flagged by a DMV worker in emails to ICE. "And when sending my information from DMV to ICE, a DMV official had written on it clearly that I was undocumented," he said. The Migrant Justice lawsuit says ICE targeted leaders of this organization, with the DMV's help. Balcazar said in the past two years, 40 people associated with his organization were arrested by federal immigration authorities. "Many of them have since been deported, and in nine of these cases, we have clear evidence that these arrests were retaliatory, targeting people because of their involvement in Migrant Justice," he said. 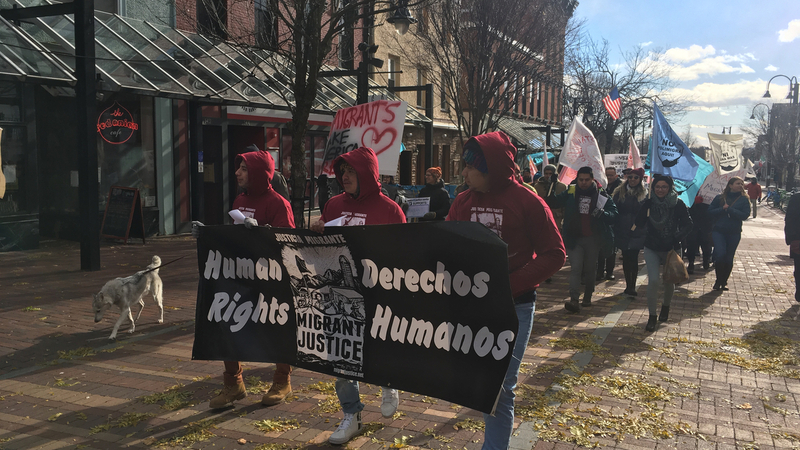 Migrant Justice sued ICE, the Department of Homeland Security and the Vermont DMV, alleging that the agencies worked together to unlawfully target, harass and detain farmworkers and Migrant Justice activists. The group claims that ICE also used electronic surveillance and an undercover informant to track and ultimately detain and deport its members. The suit alleges that the tactics were aimed at depriving the farmworkers of their Constitutional rights of free speech and freedom to petition the government, and it seeks a court order barring the alleged surveillance and harassment. DMV officials would not comment, and the court has given the state until late February to respond to the allegations. An ICE spokesman also declined to comment on the farmworker litigation, though he said the agency did not target people because of their political activism. He said enforcement priorities are based on border security, public safety and terrorism. Vermont's Republican Gov. Phil Scott said his office is investigating the cooperation between DMV employees and ICE. "It wasn't my understanding that anything was being forwarded that couldn't be forwarded," he said. "We're going to look into that as well." Yet the information sharing has added a new level of worry for the 1,500 migrants who work on the state's dairy farms. Many of the farmworkers are from Mexico. So the Mexican government comes to the state a few times a year to help its residents renew passports or obtain other documents. In December, the mobile consulate set up shop in a church hall in Middlebury, near the heart of the state's dairy country. Workers drove here from all over the state, some to get their passport photos taken, while others came just to meet old friends and share a meal of takeout pizza or home cooked tamales. One dairy worker didn't need any government documents, but came instead for the food and camaraderie. Like many of his co-workers, he's in the country illegally, so asked to remain anonymous. He's lived in the state for 14 years, and got his license soon after the 2014 law passed. "You can't live without [a] car. People live on cars," he said, citing a truism of life in Vermont. "You know, you don't have the grocery store like two-three minutes away, or five minutes away ... You got it like 10 minutes away — but driving." Now he thinks more people will be afraid to go to the DMV. "People are just going to think about more trying to get a license if the information goes to another place, you know what I mean," he said. Another farmworker who also asked to remain anonymous drove down to Middlebury from near the Canadian border. He said people may choose to stay on the farms, or drive without a license. "Some people they say 'oh, I'm not going to get a license because my information maybe go direct to Border Patrol, or any department," he said.